Today I made one of my favorite no-bake snacks — Rice Chex Bars. 1. They are ridiculously easy to make. 2. I always have the ingredients on hand. 3. I sometimes allow myself to eat one for breakfast — after all, they are made from cereal! 4. They are gluten free. And even though we’re not on a gluten free diet, I know many families who are affected by gluten allergies or choose to live gluten free. If this is the case for you, here’s a delicious snack you can actually eat! 5. They are filled with ooey-gooey peanut butter. 7. 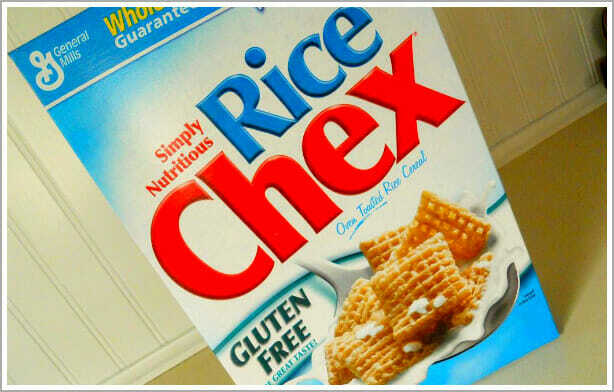 I eat the “stray” chex after I press them into the pan…and I always lick the spoon! Since I’m sure you want to make them now; here’s the recipe. Line a 9 x 13-inch pan with wax paper. 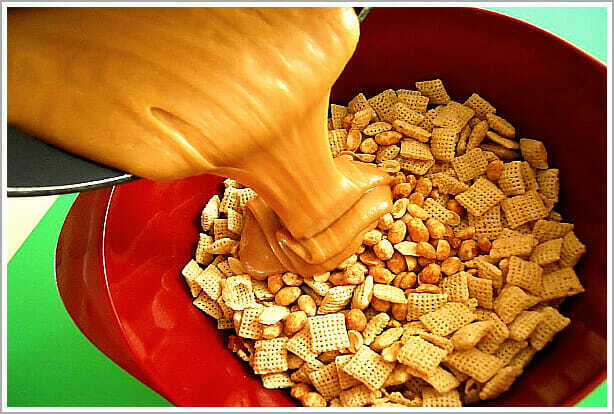 In large bowl, mix cereal and peanuts; set aside. In small saucepan, heat corn syrup and sugar over medium heat, stirring constantly. 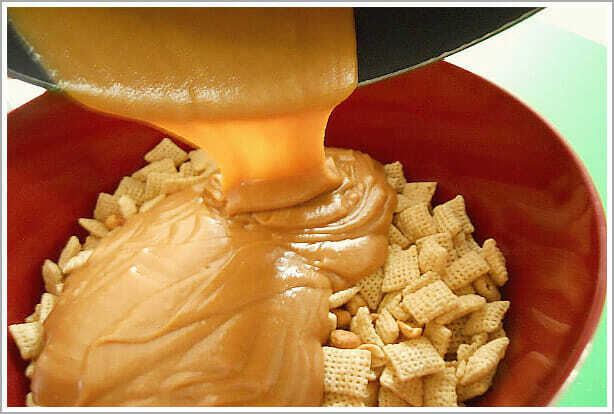 Stir in peanut butter until smooth. Remove from heat. 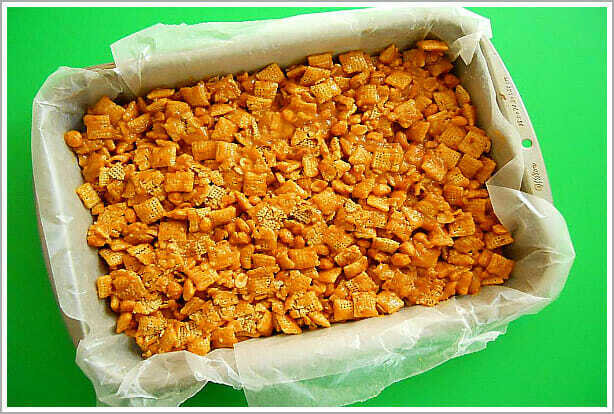 Pour peanut butter mixture over cereal mixture; toss until evenly coated. Press firmly in pan. Cool 15 minutes. She never used any peanut butter because I can’t digest peanut butter. All I found online was this much. Can you help me finish this recipe? I know she melted the choc. chips and it was put in the refrig. when done. It never lasted long because I could eat the whole pan in two days. 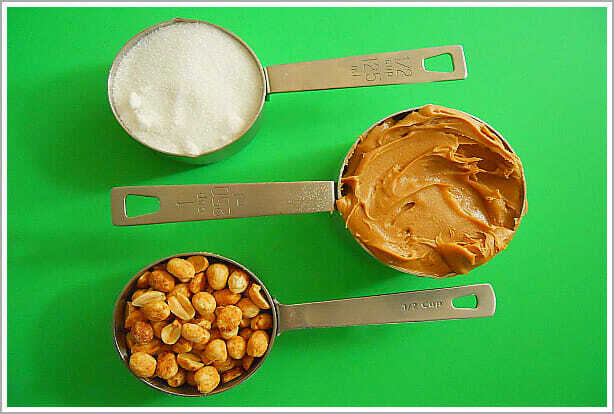 I always use peanut butter — but I’m sure you could substitute any other nut butter, sunbutter, or even Biscoff spread to replace the peanut butter in my recipe. What do you suggest I could use instead of the peanuts? The peanut butter is fine just can’t do the nuts. 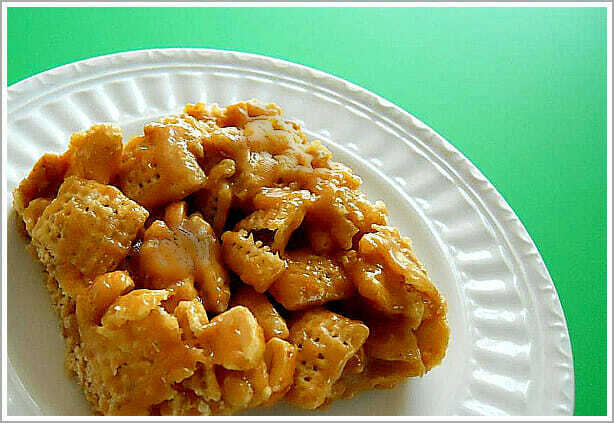 I’ve used your combination of honey, sugar, and peanut butter on different cereals (Cheerios and Kix to name a few) with delicious results. The only problem is that I can’t stop eating them… this is about the best snack bar around! Thanks for the great recipe.